The relationship between a mother and her child is a rocky phenomenon that can be difficult for some authors to capture. 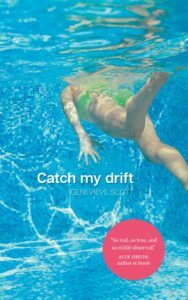 Genevieve Scott’s debut novel, Catch my Drift (Goose Lane, 2018), is a wonderfully realistic story of a complex family, and at the heart is mother and daughter, Lorna and Cara. As a millennial feminist, I’m pleased with even one unique female main character, so to read a novel with two female protagonists—women I was instantly devoted to—was a treat. Lorna’s social awkwardness and ambition, juxtaposed with Cara’s anxiety and longing to fit in, was perfectly told in this story. And while the two characters are like oil and water, I found them both utterly relatable and endearing in their own ways. One of the first things I noticed about Catch My Drift was that Lorna’s chapters were written in third person while Cara’s were in first. This was a little puzzling but I came to realise that the artistic decision arose from the fact that the story truly belongs to Cara. The narrative begins before her birth and ends with her first steps into adulthood, and we get to traverse adolescence alongside our young narrator. The readers experience Cara’s telling of her crush on her tennis instructor, the catty relationships with her teenage friends, and losing her virginity, all with a style reminiscent of Judy Blume’s young adult novels. Cara’s mental illness is subtly omnipresent throughout most of the novel, but Scott does not focus on OCD or any other label as Cara’s defining characteristic. Instead, she develops Cara as a unique individual. While it might not work in all stories, this choice definitely suits Catch My Drift because this is not a story about living with mental illness. It’s a story of an imperfect person living in an imperfect family. I have only positive comments for Genevieve Scott’s first novel. Her characterization, subtlety, use of humour and female-focused narrative made Catch My Drift a pleasure to read, and I look forward to reading further works by the author.